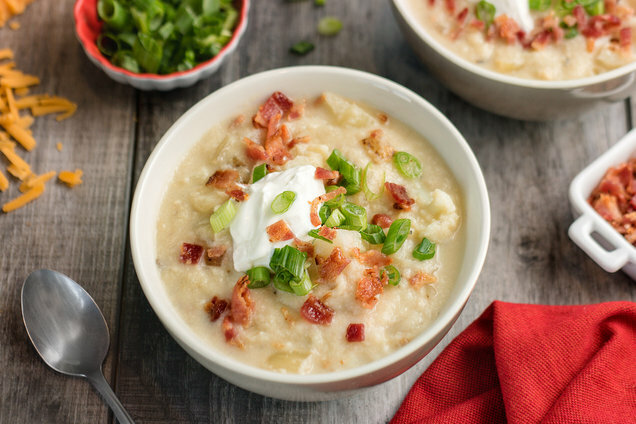 Your favorite loaded baked potato soup just got a better-for-you makeover! This new recipe is crazy delicious, packed with veggies, and sure to satisfy your comfort-food cravings. Soup’s on! Bring a large pot of water to a boil. Add 4 cups cauliflower. Cook until very tender, about 15 minutes. Drain water, and transfer cauliflower to a blender or food processor. Add milk and cheese. Puree until mostly smooth and uniform. Spray the empty pot with nonstick spray, and bring to medium-high heat. Cook and stir onion until mostly softened, about 4 minutes. Add cauliflower puree, remaining 2 cups chopped cauliflower, broth, garlic, salt, and pepper. Reduce to a simmer. Cover and cook for 15 minutes, or until cauliflower is tender. Meanwhile, cook bacon until crispy, either in a skillet over medium heat or on a microwave-safe plate in the microwave. Before serving, top each portion with 1 tbsp. each sour cream and scallions. Chop or crumble bacon, and sprinkle over each serving (about 1 tbsp. each). Carb Swap 'Til Ya Drop! Click here to listen -- anytime, anywhere! You can also find the Hungry Girl podcasts on your phone’s Podcasts app! Hungry for More Healthy Soup Recipes? In case you didn’t know, February is National Snack Food Month. Here are 18 on-the-go snacks under 175 calories… Don't leave home without one! Pass the ladle… Click "Send to a Friend" to share today’s recipes!